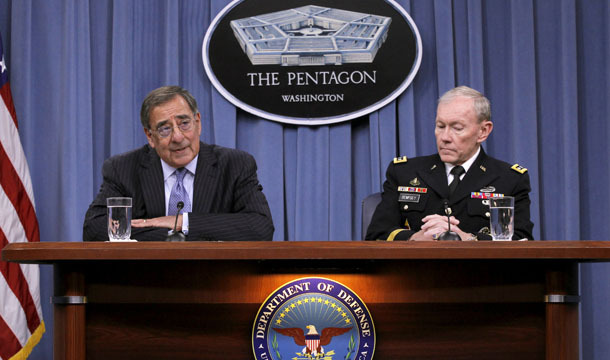 Yesterday, Secretary of Defense Leon Panetta and Chairman of the Joint Chiefs Gen. Martin Dempsey released details of the Pentagon’s plan to reduce projected military spending by $487 billion over the next 10 years. At first glance, nearly half a trillion dollars in reductions might sound like a huge cut. But in reality, if Panetta’s reductions survive Congress, the baseline defense budget will fall by just $6 billion next year and resume its growth thereafter. Let’s be clear: Secretary Panetta’s $6 billion reduction for the next fiscal year is a positive first step and a major achievement. It will be the first real reduction in baseline defense spending in more than a decade. Even more importantly, with his budget adjustments, Secretary Panetta has seized the opportunity to address some of the long-term strategic and fiscal challenges facing the Pentagon, including shifting to a posture focused on 21st century threats and working to stem the unsustainable growth of the Pentagon’s personnel costs. But with the fiscal year 2013 budget request topping $500 billion, there is a long way to go to reach sustainable levels of defense spending and bring the Pentagon budget back in line with historical norms—as we explain below. The Pentagon’s base budget request will be $525 billion for fiscal year 2013, down $6 billion from FY 2012. The problem is that this FY 2013 request will represent the only actual cut in the next decade. After FY 2013, the Pentagon’s budget will once again rise steadily, by between $9 billion and $14 billion annually over the subsequent years in nominal terms. Panetta’s projections have been mischaracterized as representing a drastic “cut” in military spending. In reality, these $487 billion in reductions over 10 years come from projected growth of military spending. As a result, even when adjusted for inflation, Panetta’s reductions halt the growth in the Pentagon’s budget, but they do not bring the budget down much from its current level. And due to the tremendous increases in spending that have occurred over the past decade, Panetta’s plan essentially holds the baseline defense budget near historic highs: Between FY 1998 and FY 2012, the Pentagon’s base budget grew in real terms by $173 billion, or 48 percent. The proposed reductions will mean the Pentagon spends only about 8 percent less over the next decade than it originally projected. These reductions fall short of a number of bipartisan deficit-reduction proposals, including those of the Simpson-Bowles Commission and the Gang of Six. Yes, the Pentagon will spend less than it originally planned, but it will still spend $2.73 trillion over the next five years, more than the $2.59 trillion spent over the last five years. The Obama administration’s adjustments to Pentagon spending are driven by both new fiscal and new strategic realities. They include reductions in ground forces, removing troops from Europe, addressing soaring personnel costs, and adjusting Tricare fees. Secretary Panetta plans to reduce the Army and Marine Corps’ active-duty force by 92,000 troops, a move the Center for American Progress recommended in its 2010 defense budget report. This choice is in line with the recently unveiled defense strategy, which shifts focus away from manpower-intensive nation-building operations. Even with these reductions, it is important to note that the Army and Marine Corps will maintain the ability to fight and win a major ground war, should the need arise. In fact, both Secretary Panetta and Gen. Raymond Odierno, chief of staff of the Army, have said they are “comfortable” and “satisfied” with these reductions in the force structure, which will leave the ground forces larger than they were when we invaded Iraq and Afghanistan. The United States will also remove two brigades from Europe—another CAP recommendation—and increase funding for Special Forces and drones by 30 percent. These moves address two strategic realities. First, our European allies, many of whom have cut defense spending in response to their own budget woes, must take on more responsibility for their own security. Second, faced with the decentralized threat of extremist networks, the United States is rightly shifting to smaller, more agile deployments. This “lily-pad” strategy, whereby small U.S. bases in a troubled region provide launching points for operations such as Tuesday’s Navy SEAL raid, is more effective than large deployments, provokes less ill will, and requires fewer resources. Yesterday, Secretary Panetta also laid the groundwork for the Department of Defense to take on its unsustainable personnel costs. These costs have increased by 40 percent above inflation since 2001 and must be brought under control. According to the bargain we make with the men and women who volunteer for our military, they deserve to be paid as much as their civilian counterparts of comparable qualifications and have access to affordable, top-quality health care for life and excellent retirement benefits. But as the Pentagon’s own studies document, the current military compensation levels have exceeded the standards set by the Department of Defense’s Employment Cost Index. The compensation, health care, and retirement systems in their current forms are simply unsustainable in the long term. To address these costs, Secretary Panetta announced the Department of Defense’s intention to increase the fees paid by retirees in order to preserve the long-term viability of the Tricare military health system, as CAP recommended in the 2011 report, “Restoring Tricare.” He also called on Congress to establish a commission to review military retirement and announced that military pay raises will be limited beginning in 2015. These adjustments should bring total military compensation back in line with the Employment Cost Index, as the policy dictates. Additionally, Secretary Panetta wisely advocated another round of BRAC base closures to further reduce unnecessary Pentagon expenditures. The BRAC process allows independent experts to submit a list of recommended installations for closure or consolidation to a simple up-or-down vote in Congress—the best way to avoid partisan or parochial deadlock on these crucial decisions. The underlying facts of Panetta’s announcement yesterday should not be lost in the debates that will surely rage up to and beyond the release of the full budget details in February. The defense “cuts” are in fact one small year-to-year reduction followed by continued growth. The reductions still fall far short of historical standards, by which we are still in a period of heightened military spending. Unfortunately, we have done nothing to roll back more than a decade of continuous growth in military spending, despite the end of the war in Iraq and the beginning of our drawdown in Afghanistan. The shifts Secretary Panetta outlined yesterday represent a small step toward a more reasonable, sustainable strategic stance, but they still avoid many of the hard choices the Pentagon must face over the coming years, including eliminating the Navy and Marine Corps versions of the F-35 and reducing the planned purchases of the new ballistic missile submarine. Lawrence J. Korb is a Senior Fellow at the Center for American Progress. Max Hoffman and Alex Rothman are Special Assistants with the National Security and International Policy team at the Center.